As noted by 9to5Mac, Apple has added Dolby Atmos support for iTunes Movies in the latest beta of tvOS 12, with several titles already being upgraded to work with the immersive audio feature on Apple TV. 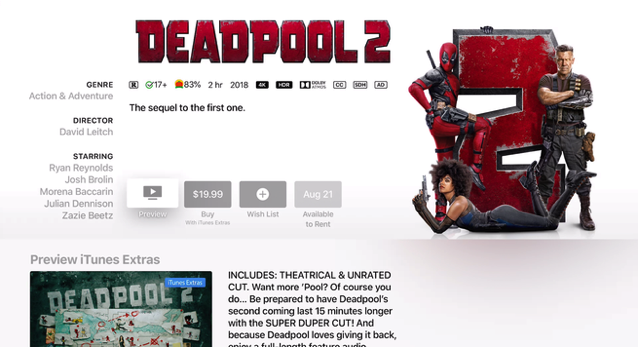 With the public release of tvOS 12 next month, Apple will also upgrade compatible movies purchased from iTunes with Dolby Atmos support for free. When tvOS 12 rolls out, the Apple TV 4K will become the only streaming media box to work with both Dolby Vision high dynamic range (HDR) picture quality and Dolby Atmos immersive sound. A quick Siri search for “Show me movies with Dolby Atmos” responds with a listing of movies that Siri says “will sound great in Dolby Atmos” as well, although you’ll need to open each title in iTunes Movies and not other apps to use Dolby Atmos compatibility. Dolby Atmos will work with Apple TV 4K and Dolby Atmos compatible speakers and receivers. iTunes Movies Store listings now also denote Dolby Atmos support where available. Compatible titles include Baby Driver, Blade Runner 2049, Deadpool 2, Justice League, Peter Rabbit, Spider-Man: Homecoming, and Suicide Squad.